If you’re seeking for adventure in Philippines, Sagada might be a perfect place for you. I’ve been mesmerized with this small city but full of adventurous activities. 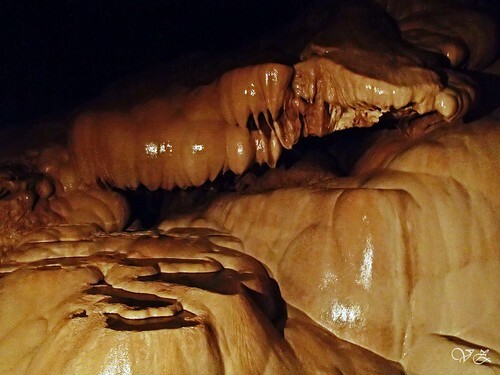 There are tons of things to do in Sagada starting from mountain biking/trailing, cave exploration, waterfall trekking, also learning about the local culture. Sagada is located in Mountain Province. I think the name is tricky, is it the name of the mountain is Province, or the Province name is Mountain. I got the answer. In fact, it is the Province which named Mountain, confusing right? From Banaue we took a van heading to Bontoc for one and a half hour. Don’t sleep along the ride because the view is spectacular with all the green mountains and some rice terraces. From Bontoc City there’s a jeepney to Sagada. I wasn’t awe by the city at first but the more I stay in Sagada, the more I love the city. The fresh cool weather and the comfortable ambiance of the city hypnotized me to stay. Unfortunately, I didn’t have much time left so I only spent two days in Sagada, skipping all the activities that could possibly done in Sagada. 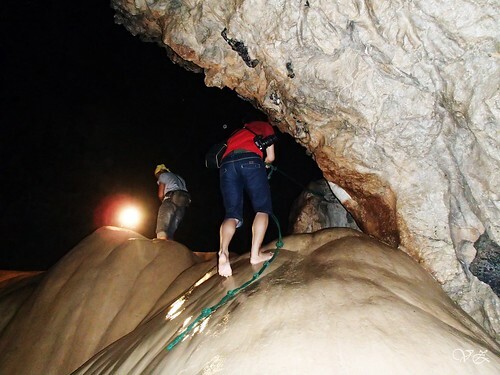 I did only short caving to Sumaging Cave, one of the most favorite attraction in Sagada. First part of the cave is slippery since the moss covering the stones. Hang on the stone side so you won’t fall and hit your head. Then after passing this slippery path, we had to take off our sandals and stepping on a nice surface, don’t worry it’s not slippery. There are some small pools inside the cave, it’s very fun dipping your feet in the cold water. Overall, it’s an easy one and a half hour caving but in some point you need to be extra careful especially in the rope part. I almost fell because my leg slipped off the other way, it’s hard to balancing myself. After all, I remembered what my guide told me, don’t let off the rope whatever the situation is. We’re lucky to get a hilarious plus good looking guide telling us to use our imagination inside the cave. He likens the rock shapes with funny interpretation. Pregnant queen, crocodile, birthday cake, even the famous Banaue Rice Terrace. I’m not sure whether they’re stalactite and stalagmite or just a rock formation because the shapes are unique, different from what normally I saw. At the end of the cave, our guide showed us that before this cave was under the sea proven by the shell fossil attaching in the wall. Amazing. A short visit to Lumiang Cave as a part of the tour where ancient coffins were put right just the entrance. A short walk from the road side to the cave takes around 10 minutes. There’s no sign indicating the location. All I could just remember is a small store beside the entrance. You may ask locals. There’s one coffin with “Gaeko” carved on the top of the coffin. “Gaeko” or lizard means happiness and prosperity. This tradition is no longer followed but still it is once a tradition and heritage for the young generations. The famous hanging coffins are actually can be seen from a view point just 15 minutes walk from the town. I thought it’s close but actually the hanging coffins are located on the wall and it’s a bit far from the point. From Banaue there’s a mini van leaving to Bontoc (PHP 150) approximately one an a half hour, then from Bontoc a jeepney leaves to Sagada (PHP 50) for one hour. From Baguio there’s bus leaving from the terminal. Travel time around 6 hours (PHP 220). Bus schedule from Sagada to Baguio: 5 a.m., 7 a.m., 8 a.m., 9 a.m., 10 a.m., 11 a.m., 1 p.m.
Jeepney from Sagada to Bontoc: 6.30 a.m.-12 p.m. I stayed at Residential Lodge, it’s still 500 meters down from the city but it offers a nice homey feeling. Moreover it’s cheap, only PHP 250/person/night. St. Joseph Rest House also has the cheapest room for PHP 500/room/night. It has restaurant as well, although the service is kindda slow. There are also tours to waterfalls, just have a look at the tourist information center.